Have a Wonderful Christmas everyone. The Nursery staff are delighted to announce that from your very generous donations at our Nativity performance we have raised £282 and €60. We will be able to purchase our outdoor overalls in the New Year, your support is very much appreciated. Enjoy the magic of Christmas and see you all in 2019. Primary 7 have been working on a Christmas craft with a difference this year, as they created St Mary’s first ever igloo! This STEM task enabled pupils to enhance their mathematical, technological and thinking skills. The idea came from our Eco Committee and the finished product has been given as a gift to the new Accelerated Reading library. The children invited the kitchen staff down to see the finished article today as many of the milk cartons came from the canteen. Bernie liked it that much she wanted to try it out for herself! Bridging the entrance and forming the closed roof at the top. P7 certainly used a lot “i-glue” in this project, pardon the pun, but can anyone guess how many cartons were used? Pupils can submit their guesses tomorrow to win a special Eco Schools prize! P7 Postal Service Delivers for St Vincent de Paul! Over the past two weeks P7 have been raising money for St Vincent de Paul. They organised a successful daily postal service for Christmas cards and ran a door collection at the P5 Nativity Play. We are pleased to announce that enough money has been raised to purchase all four £35 voucher gifts from the SVP tree in St Mary’s Church (a gift from each KS2 class). Representatives from each of the four KS2 classes are pictured with their voucher gift before it was taken to SVP in Newry. £140 is a fantastic total and everyone who contributed can be very proud of the fact that they are helping others at this difficult time of year. An additional £21 was collected today and this will also be donated along with any additional money collected tomorrow. 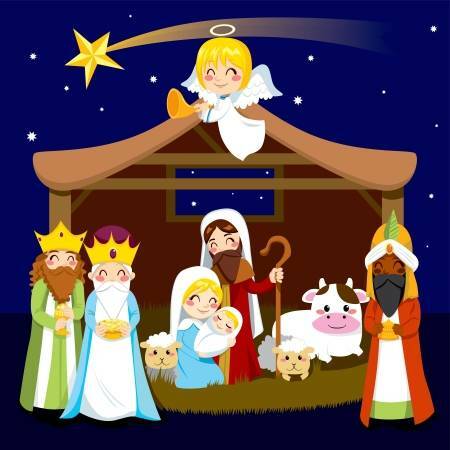 Tomorrow the Nursery will perform their Nativity show for the local Alzehimers support group. We ask that all children take their costume back into school tomorrow. The P7 year group had a great morning exploring Newry Museum at Bagenal’s Castle. The fun workshops were based on the theme of Christmas. Pupils completed arts & crafts activities, played with old & new toys from around the world and learned about the origin of many Irish Christmas traditions, with a particular focus on the Victorian era. This tied in with their studies this year. It was a lovely day out for the children as they edge closer to the Christmas break. KS2 classes are hoping to raise some money to purchase gifts from the St Vincent de Paul Christmas tree in St Mary’s Chapel. As well as bringing in some small change from their piggy banks at home, pupils have come up with some other initiatives. The P7 year group are running a Christmas postal service for all classes within the school for the two weeks leading up to the holidays (Monday 10th December – Friday 21st December). They gave a presentation at assembly last Friday, which covered the key points below. Children are invited to post all of their cards to classmates and/or those in other classes for the small total of £1, which will go to SVP. Post boxes and accompanying money boxes are placed throughout the school. There will be a post collection after registration and delivery after break each day. If children wish to avail of this service, they should label their envelopes with the first and second name and class of the child they are sending the card to before posting. On Wednesday evening at the P5 Nativity in St Mary’s Chapel, there will also be a door collection for any loose change, with again all proceeds going to St Vincent de Paul. KS2 classes wish to thank everyone in advance for helping a worthwhile charity at this difficult time of year for many people. Friday will be a celebration of two important elements in our school, our dedication to helping every child become a lifelong reader, and our commitment to winning a green flag for being an Eco–school. We are combining the postponed World Book Day activities with a Green Day event. A £1 per child or £2 per family donation for school funds would be appreciated. We wish everyone a Happy Saint Patrick’s Day and a relaxing time reading your book choices on Monday 19th.